Modern tournament decklists are flooding in to the point where the phrase “too much of a good thing” is starting to come to mind. Nah, who am I kidding. I love this stuff. I hope you do too, because today we’re going to dive right in. I plan on recapping and analyzing high-level Magic tournament results until the day I die, so let’s swallow the knife and get down to it. Today, we’ll be taking a look at the 7-1 or better decklists from Star City Games’ Invitational in Roanoke, along with the Modern Open results, Modern Classic top performers, and select lists from the Modern MOCS event. That’s a lot of info to go through, so we’ll do things a little differently today. Let’s begin! When looking at four events worth of data, we run the risk of getting hopelessly lost in the shadows. It might make sense to divide and conquer, by approaching the data in stages. We’ll start at the macro level and increase in detail, but keeping the events together—that will let us sift through all the information in manageable chunks. As long as we take care not to draw conclusions from finishes across events (taking a finals performance of Affinity and comparing it the Top 4 representation in another event, for instance) we should avoid any potential landmines just fine. For the purposes of this article, I will be aggregating the Top 16 of the Roanoke Open, the Top 8 of the Classic, all 7-1 or better Modern decklists from the Invitational, and all x-1 or better lists from the MOCS. This leaves us with 15 Invitational lists and 10 MOCS lists to go with 24 lists from the Open and Classic combined. We’re already making some assumptions and skewing data just by choosing which filter to apply to the lists, so before the breakdown, I’ll give a brief reasoning for why I chose to filter the data this way. When viewing multiple events worth of data, it’s essential to find a delicate balance of inclusion that doesn’t apply too much weight towards one event or overshadow another. On the other hand, multiple event analysis brings with it a bunch of issues, such as how to parse split-format results like the Invitational with “lower-merit” results like the Classic. There is no easy solution, but by sticking to a linear progression of events, wherein the higher-weighted events are contributing more lists, we can build in some protection against inaccurate conclusions. This gives us 39 entries to analyze, in the hopes that when combined, they will give us a clear picture of the top performers in Modern at the beginning of July. As is shown in the numbers, we’re following that linear progression for the most part, with the only outlier being the Modern Open contributing one more list than the Invitational. Here, I could see taking only the Top 12 of the Open, which would fit in nicely between the Invitational’s 15 lists and the MOCS’s 10, but excluding 13th-16th just feels wrong. Perhaps it’s because we always speak in doubles (champion, finalist, Top 4, Top 8, Top 16, Top 32), but drawing an excluding line that doesn’t fall on one of those boundaries feels incorrect to me. Finally, I’m placing the Open ahead of the MOCS here, even though you can argue that the MOCS finish is more prestigious. Open events contain many more rounds, and as it stands currently I don’t have Top 8 information for the MOCS. On to the numbers! Before moving on to the next phase of analysis, I’m curious what happens when we combine like archetypes in an attempt to gain a more macro perspective of the data. Looking at the archetype representation across all four events gives some interesting pieces of information to tackle at first glance. Of course, the biggest story here is the goose egg Dredge put up, unable to make a strong finish in any event of the four. Going back into the lists confirms the horrible performance by Dredge, as only one pilot was able to make it into the records for any event: Ben Weitz (BSWeitz on MTGO) with a 6-2 performance in the MOCS. In a similar fashion, Burn put up disappointing results, in the sense that one finish across four events is underwhelming if we buy into the narrative of Burn as a significant player in the format. Finally, after a strong performance the week before, Hatebears seems to have been hated back out of the metagame, with Grixis Death’s Shadow numbers predictably rising back up to re-take its formidable share of the format. That is, until you actually look at the decklists, and see that Brian Coval’s Death and Taxes list that won the Invitational is actually… Mono-White Hatebears. We need to agree on some naming conventions here, guys. Well, that definitely tells a different story. Looking at the results through this lens immediately challenges a few of my perceptions about the results. First, while the established non-Shadow midrange decks (Abzan and Jund) put up uninspiring results individually, collectively the macro-archetype performed well, especially considering the narrative that Eldrazi Tron has been pushing midrange out of the fold. While Abzan and Jund account for only 50% of the midrange representation, BG, Death and Taxes, and BW Smallpox each make a case for midrange succeeding in Modern, albeit in unconventional forms. Going further, you can make a case for the RW Prison deck as midrange as well, along with Kevin Jones’s Jeskai Control list, which makes use of large amounts of burn and Spell Queller. Finally, Eldrazi Tron remains the ever-changing enigma it has been for months now. You could call it midrange, mana deck, or non-Affinity Aggro. But to be as accurate as possible, Eldrazi decks deserve their own category, with the knowledge that they play multiple roles well. I would hesitate to apply Eldrazi Tron’s numbers towards the mana decks category, as that can lead to inaccurate conclusions about the format. Keep that mental asterisk in place, though. Enough with all this Top 16 talk. What about the winners? Here are the finalist performers from each event, with the 8-0 MOCS list subbing in. Here we come to an impasse, as the Top 4 Invitational Modern lists all failed to go 7-1 or better in the main event. 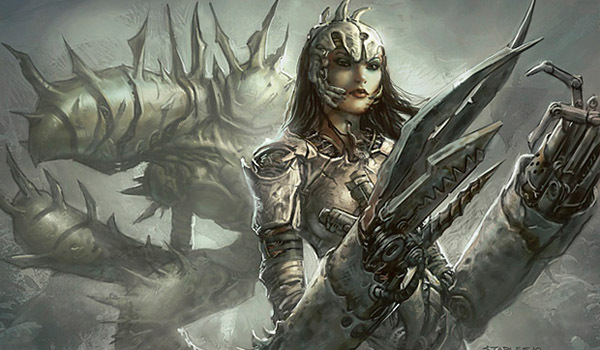 Nevertheless, three of the four 5th-8th-place lists did go 7-1 or better in the Swiss, and the Top 4 Modern lists had to fight through them to make the semis, so by default, the numbers have to be included. This makes things really messy though, as Brian Coval’s Invitational-winning Death and Taxes/Hatebears list is not the one represented in the preceding section of our analysis, which belongs to Robert Luposki’s 13th-place finish at the Open. The same can be said for Daniel Fournier’s 2nd-place finish with Grixis Death’s Shadow. Still, for those wondering where the format goes from here, the majority of the field will be reacting to the winners, and not to the 39-list breakdown I posted above. Hopefully, we can get a step ahead by using the former to inform our analysis of the latter, but if the masses choose to head in another direction, can we really say they are wrong for doing so? Besides the two copies we saw, where are all the other Hatebears decks? Was the deck “worth” targeting? Or is it more likely that the conditions aligned perfectly for a poor deck to put up results for just a week? We can’t answer those questions without diving into some lists. Hey look, Liliana of the Veil in the maindeck! This is a move I’m happy to see, and it’s not just a flash in the pan, as Dan Jessup had two copies in his sideboard as well. More interesting right now, however, are the two copies of Izzet Staticaster in the board, which show a concentrated desire to be prepared against Lingering Souls tokens and a myriad of x/1 creatures. Grixis Death’s Shadow maindecks will always be tight, and at this point 10-15 sideboard cards are set in stone for the most part. It’s those small deviations and opportunities for gaining an edge where we can really gain an insight into what was going through these players’ heads as they were preparing for the tournament. Beyond that, I’m interested in Disdainful Stroke as an extra form of disruption against both Eldrazi Tron and Nahiri, the Harbinger. Control and midrange were out in full force across these events. This is a move I can get behind, as it’s basically a Negate that counters Thought-Knot Seer and Gurmag Angler while also stopping planeswalkers and Collected Company. I definitely wouldn’t cut a Ceremonious Rejection or Stubborn Denial for it (and I’m glad Daniel didn’t), but if you can find the room, which Daniel certainly did, I think it was a great card for the weekend. This list isn’t Faeries. It’s actually good. Brandon Dempsey took the best cards out of Faeries (Spellstutter Sprite and Bitterblossom) and stuffed them into a blue-black control shell, and the results are glorious. This new version of Faeries has actually been floating around for a while on MTGO, but hasn’t done much outside of a 24th-place finish at GP Vegas by Yuta Takahashi. Cutting Vendilion Clique and Mistbind Clique, and pushing up to the full four of all our best cards, gives this archetype what it’s always been missing: consistency. The games where we don’t draw Bitterblossom were always the worst, which is the biggest “bad deck propped up by good card” smoking gun I could think of. So, cut the bad cards. It’s that simple. In the end, this pairing will probably always play second fiddle to white’s great answers and sideboard spells, and a win condition that hurts our life total in a color combination lacking for lifegain will continue to cause us issues. Still, the archetype finally feels streamlined, powerful, and consistent. It just needs the metagame to shift in a certain direction (along with the right list and pilot) and it’s capable of cracking the finals threshold. When we get to the point where control decks can play Damnation in the maindeck, that’s when we know we’re there. I’ve been pretty hard on RW Prison in the past, but this is a version I can get behind. Four-x Blood Moon, Chalice of the Void, and Nahiri, the Harbinger isn’t enough to win against a diverse field, and the deck has needed to adapt to survive for a few weeks now. If there’s something there, I think it involves Gideon of the Trials. Simian Spirit Guide remains one of the strongest cards in the deck, but with our high land count and effectively dead cards in every matchup, we need our bomb to be just that. Gideon of the Trials on turn two, or even just cast normally, followed by another planeswalker, is the type of oomph we need to make up for our awkward maindecked role-players. Again, though, none of this is new tech. RW Prison is succeeding right now because midrange and control are creeping back into the picture. Dredge, Storm, Living End, Ad Nauseam—all of these weird spell-based combo decks are falling away, thanks to discard, Stubborn Denial, and a quick clock. That’s letting value midrange decks gain a foothold again despite a bad matchup in Eldrazi Tron. Once RW gets its sideboard down, watch out. I’d be less surprised to see this spike an event before Jund or Abzan, and it could happen quickly. So there you go—I said positive words about RW Control. We’ve seen it all, folks, time to shut it down. There’s a million more nuances and takeaways we can pull from this quartet of events, but I only have time for a few. What did you think of the results? Any takeaways or clues to the format’s next steps that you think I missed? Let me know in the comments below. Thanks for reading, and I’ll see you next week.